Livelihoodhome is the name of the company that owns Blue Sea Estates. Blue Sea Estates therefore is the tangible product upon which Livelihoodhomes is branded. They have more than 23 estates and 13 offices spread across Nigeria especially in the eastern and western parts. It was a beautiful challenge developing and designing the structural flow of their website because the site has to incorporate the actual location of each estate and the pressing demand to spur targeted audience along the conversion path in order to take the desired actions. So, we had to factor in Google map and then leverage easy accessibility of contact agents for each property preempting the desire of audience to either call or send a message. 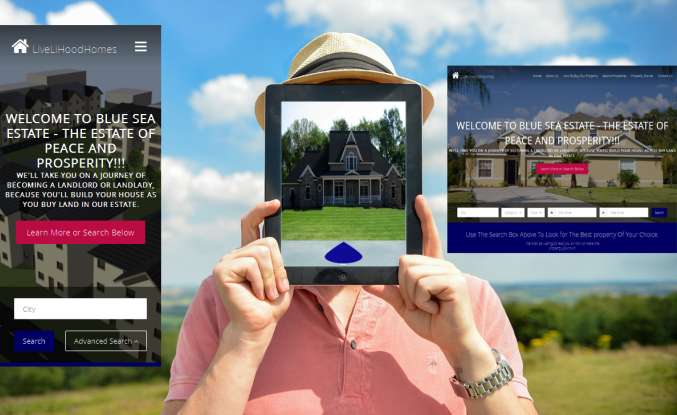 A property search form was positioned conspicuously for audience to use to quickly find Blue Sea Estates within the location of choice and the price range. Click Here to Visit the Site | This domain is temporarily unavailable for now. The website was built under our business website package. We were also given the maintenance contract for effective update. We are therefore a part of the organization, contributing to the growth of the business through web development. You can also invite us to be part of your business by giving us the design project of your business or manage an existing one or better still re-design it if it doesn’t compliment the brand you labored hard to build offline. What do you think?